Perhaps it’s because acne is predominant in oily skin; We tend to blame oil for all our breakouts. If we have acne prone skin, we avoid applying oil or any products containing oil on our faces. But, is that really the answer? Or, are we doing more damage than help. Ayurvedic practitioners recommend adding oil to fight acne (especially adult acne). After years of suffering from adult acne, many have found a cure by taking a few breaths and slopping on a bit of oil on their faces. And voila, clear skin and happiness! While using oil benefits teenage breakouts, it is especially good for adult acne. This is because it helps to treat many skin problems that occur as our skin matures, such as sun damage, pigmentation, fine lines and loss of tone. So many people over thirty are relieved when they learn they can address pimples while preventing wrinkles, ending the daunting dilemma between treating their acne or aging. Conventional acne solutions involve harsh, drying acids, peels and astringents that lead to dehydrated, devitalized and sensitized skin. Using nourishing natural facial oils actually feeds, protects and supports our skin tissue, helping to restore its balance and ward off pimples while promoting moisture and hydration. Still don’t believe in the power of oil? Read on for the reasoning behind why oil is the ace-in-the-hole against adult breakouts. Many think that adding oil to your skin will clog pores. In fact, it is dehydration of the skin that clogs the pores. When this occurs, our skin’s natural oil cannot secrete easily and lubricate its surface. Instead, it becomes thick and hardened and gets lodged in our pores, creating corks of dried out sebum. So what kind of oil should you use? Plant derived oils, like olive oil, help to prevent dehydration and thus, keeps the pores clean and open. Dry skin allows for tiny cracks in the tissue which creates a channel for acne-causing bacteria to get in. Therefore, adding oil will keep your skin hydrated and create a solid barrier from bacteria. We tend to try to reduce oil on our skin by over-washing and then using astringents to further dry up the skin. The result is quite simple. The more you dry out your skin, the more your skin tries to bounce back by producing more oil – in excess. This overproduction of oil will stimulate more acne production. To balance out your skin and keep the sebum production at bay, don’t wash your skin more than twice daily and replenish your skin with oils such as jojoba, which are structurally similar to sebum. Many acne sufferers know this acne quite well. Red, blistering breakouts need comforting, soothing ingredients to diminish swelling and heat. Coconut oil is a great anti-inflammatory and antiseptic oil. This oil helps calm irritation, including that of blemish redness. Use coconut oil in conjunction with turmeric, chamomile and lavender to bump up the antiseptic and anti-inflammatory effect. Read about all the benefits of Turmeric for your skin! Just as important as overcoming acne is getting rid of the evidence. Dry, dehydrated skin scars more easily and also has more difficulty healing. Oils such as seabuckthorn berry and rosehip oil replenish the skin as well as contain high amounts of vitamin C. This antioxidant is excellent for helping to fade pigmentation and scarring. However, rosehip oil can be too stimulating for acne-prone skin so it should only be used on alternating days to avoid triggering breakouts. Try ReNude’s Turmeric Antioxidant Mask to supplement your skin with Vitamin C and Turmeric! If you’re tired of having this adolescent menace follow you into adulthood and are feeling brave, maybe it’s time to give oil a shot. What have you got to lose? Need more proof? Check out the evidence behind Turmeric and Coconut oil for Acne. Acne rosacea or simply, rosacea is a chronic skin inflammation especially around the nose, cheeks, chin, eyelids or forehead. This inflammation resembles prominent blood vessels that spread in spider-like webs across the face, skin eruptions like acne, redness or swelling. Other symptoms include flushed face, swollen and red nose and irritation of the eyes or burning sensation. Rosacea is more prevalent in those who have fair skin, blush easily and are in between the ages 30-50. Rosacea can exist on its own or could be a side effect of other skin and eye disorders. While harmless, this skin condition could cause a permanent change to one’s appearance and often results in a loss of self esteem and psychological damage. There is no established cure for rosacea. People use many home remedies, oral antibiotics or antibiotic ointments to control rosacea. There are also some preventive measures that can control flare-ups and include avoiding sun exposure, using sunscreen regularly, reducing stress and avoiding hot beverages, alcohol and spicy food. There are many herbal and natural remedies based on turmeric, aloe vera, etc., that have anti-inflammatory and therapeutic properties which can heal conditions like atopic dermatitis, rosacea, erythema caused by exposure to UV light, drug-induced skin problems, psoriasis, and irritated or sensitive skin. In fact, in India there are are several topical creams which contain turmeric as an active ingredient to treat these skin ailments. However, skin treatments using turmeric are not a recent discovery, as it has been a popular ingredient in Ayurvedic and Chinese medicine for centuries. It is now, finally gaining in popularity globally as a treatment for various skin conditions including rosacea, acne and eczema. Inflammation causes release of certain mediators that cause an increase in permeability and dilation of capillaries leading to inflamed and swollen tissues. Turmeric used in animal models has shown to block these mediators; thus, preventing the cascade of cell inflammation. There are different ways that turmeric can be used to soothe symptoms of rosacea. Since it is an anti-inflammatory agent, it can reduce irritation and puffiness and improve circulation around the inflamed areas. Other inflammatory conditions can cause rosacea and other skin complaints. By acting as a liver detoxifier and wound healer, turmeric can help cure rosacea inflammation too. Otherwise, you can combine ½ teaspoon each of sandalwood and turmeric powders and apply on the inflammation. Turmeric is also said to benefit skin rejuvenation and help remove signs of premature skin aging. It has been suggested that using a turmeric face mask regularly can reduce redness and the small pimples that erupt on the face due to rosacea. Turmeric infused teas can also detoxify the body from within and clear skin of various ailments. If you suffer from rosacea, try ReNude Turmeric Antioxidant Mask. It contains both Sandalwood and Turmeric and won’t stain your skin! There are two ways you can use turmeric to improve rosacea. You can take it internally as a supplement which will improve your overall general health and also benefit acne and rosacea or you can apply it as a face mask. For maximum benefit, you may opt to combine both of these options. If you choose to supplement internally, adults can use tablets or capsules, tincture or fluid extracts. The recommended dosage of standardized curcumin powder is 400-600mg thrice daily, dried turmeric root – 1-3g daily, cut root – 1.5-3g daily, fluid extract – 30-90 drops daily and tincture – 15-30 drops 4 times daily. You can also add turmeric to your soups, eggs, and curries. For a nice facial treatment mask, you can try ReNude’s Turmeric Antioxidant Mask. To boost your turmeric intake, try out this recipe for a delicious spiced turmeric tea. 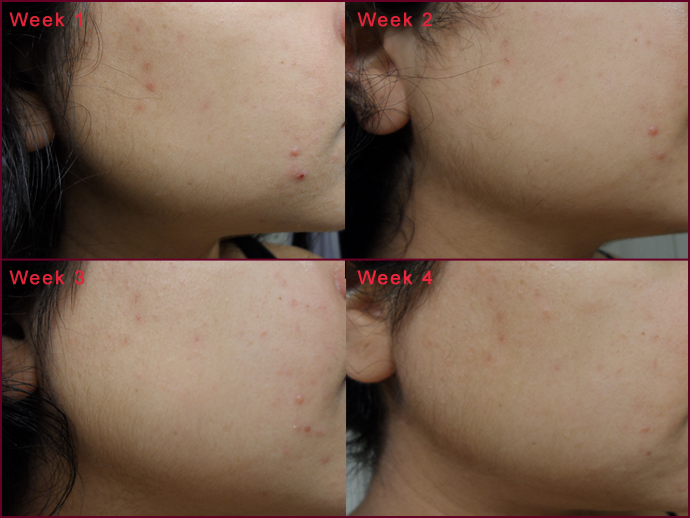 To put our product to the test, we followed one of our acne-suffering customers (Sandy) for only one month. 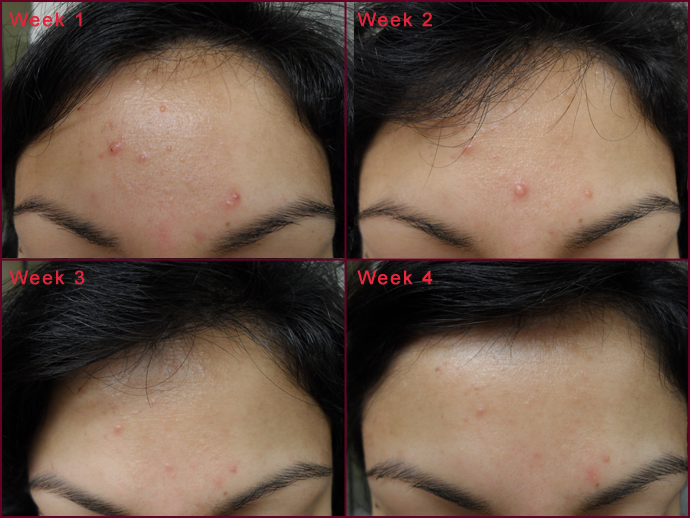 We had her apply the ReNude Turmeric Antioxidant Mask twice a week and take progressive photos, every week, for 1 month. To mix the mask, Sandy used used water and a few drops of olive oil. After the first week, Sandy felt that the redness and the overall appearance of the small bumps was reduced. She felt that her skin felt “cleaner” and smoother. She noted that the larger acne spots were feeling much “calmer”. The greatest improvement was noted in these weeks. Most of the larger acne has subsided with no new breakouts. As you can see, the smaller “bumps” are less red and have almost diminished. Sandy felt that the mask really helped with the larger and more inflamed acne. She loved the way the mask improved her skin and plans to continue using it regularly. Sandy’s acne was predominantly on her forehead. You can see a gradual reduction in the overall redness and inflammation of Sandy’s blemishes. The larger acne has diminished with no new breakouts. There is also an overall improvement in the texture of her skin. Again, you can see on Sandy’s right cheek, there was a gradual, but very noticeable improvement in the acne. The redness is diminished and the skin has an smoother texture. Sandy had quite a breakout of smaller acne on her left cheek, which has improved each week. 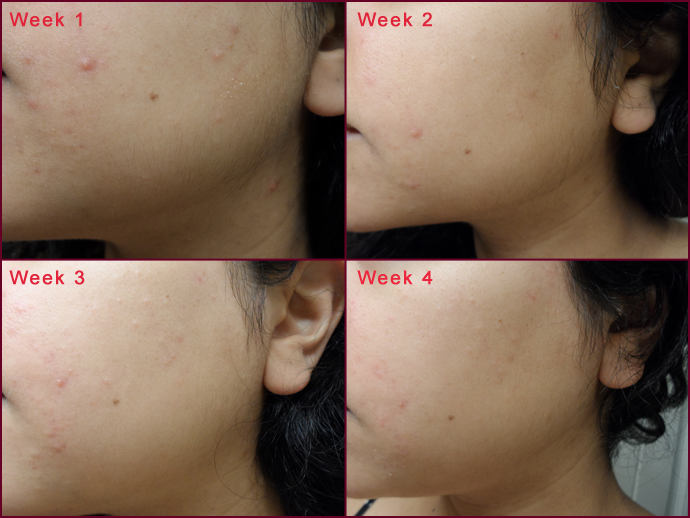 There are no new breakouts and the previous acne is significantly reduced by the fourth week. Because she was pregnant, Sandy was looking for an all-natural solution for her acne to minimize the risk to her developing baby. She was impressed by the outcome of her 4 week trial of ReNude Turmeric Antioxidant Mask and plans to continue using it to keep her acne under control! Stay tuned for her latest results! Comments Off on How Does Turmeric Help You Lose Weight? Turmeric is a beautiful bright orange spice that can be found in an Indian marketplace or kitchen where delicious curries and other vegetable dishes are prepared. In fact, turmeric is an essential part of spices that you see labeled Curry Powder. Turmeric comes from the root of a plant, and it is ground into a powder. For centuries, Asian communities have used turmeric for cooking and for healing wounds. The great news for weight-watchers is that this spice can help you lose weight. Here is what researchers have learned so far. Did you know that turmeric also has beauty benefits? Curcumin is a plant-based polyphenol that is found in turmeric, and it is the reason why researchers want to study turmeric further. They want to find out all they can about its link to weight control. This ingredient in turmeric is said to help break down fats in the body. In doing so, turmeric may help to regulate the body’s metabolism and it may contribute to successful weight management. Studies using mice have drawn interest and have led to more discussions about how turmeric may curb weight gain in humans. Researchers at Tufts University in Boston fed a selected group of mice with curcumin added to the animals’ food. What they found is that curcumin appeared to curb the amount of weight gained in mice; the surprising twist is that the animal feed had a high fat content, and yet these mice did not gain a lot of weight. Their weight gain was less than in another group of mice in the study that never had curcumin added to their high-fat feeds. The inflammation that is associated with obesity is because of the presence of immune cells, called macrophages, in the body’s fat tissues. These cells produce “cytokine” molecules that can cause inflammation in organs. Scientists looking for ways to understand obesity have suggested that if they can suppress the number and activity of these cells with turmeric, it may be possible to reduce some of the adverse consequences of obesity. In a Columbia University study of turmeric, researchers discovered that mice that were fed quantities of turmeric had a reduced incidence of diabetes and were not susceptible to weight gain. They also had fewer liver problems than the control group. Turmeric administration was also associated with a decline in body weight and fat content. With a lot of cautious optimism, research interest is high regarding spices that have been shown to exhibit activity against obesity through antioxidant and anti-inflammatory mechanisms. Those spices include turmeric. Studies have been focused on mice and it may be too soon to tell if turmeric can have the same effect on humans. The signs are promising and there will be more studies to watch for regarding the links between turmeric, weight loss and anti-obesity. More evidence is needed on human rather than animal subjects. The turmeric plant was initially cultivated in India, China and the Middle East but is now grown in other tropical areas, too. If you look around, you will most likely find interesting recipes that call for turmeric, yet do not have a curry base. In years or even months to come, with all this interesting research, turmeric is bound to be a more familiar word in your diet vocabulary. This is the painful, self-esteem bursting acne that is typically only treated by prescription medications. This type of acne is the worst possible type of acne as it is quite visible, hard to control and leaves behind nasty scars on your face. This is why many people turn to antibiotics or other pharmaceuticals in the hopes to minimize the damage. While some relief may be obtained, it tends to be temporary and leads to the development of drug resistance and many side effects. Well, there’s the infamous Accutane. This drug is so nasty that monthly bloodwork must be done to ensure it isn’t damaging your liver. Not to mention, all the side effects you experience while taking it: severely chapped lips, dry skin, and mood problems to name a few. Sadly, many of you will find yourselves going down this route. So how else can this be approached? Perhaps in an all-natural way! Turmeric has been shown to be effective as a natural antibiotic in many different applications. In Indian culture, turmeric has been used for centuries as a treatment of skin disorders, such as acne and rosacea. Just recently a study was done, which found some evidence that curcumin (the active ingredient in turmeric) and lauric acid (a fatty acid found largely in coconut oil) applied together to your skin may keep your acne at bay. The lauric acid helps the curcumin penetrate and accumulate in the skin to allow it to inhibit the bacteria that causes inflammatory acne. Read about all the other benefits of using Turmeric for beauty. How the Heck Do You Use Curcumin & Lauric Acid? Curcumin is found in the common spice turmeric. Turmeric has long history in India of being used to condition the skin. Turmeric has been a part of the women in India’s daily facial care regimes for centuries. Traditionally, turmeric is used as a bridal ritual before the wedding to make the skin soft and smooth. Lauric acid is the most abundant in human breast milk and coconut oil. Coconut oil is close to 50% lauric acid. In Asian cultures, coconut oil is very commonly used to nourish the skin due to its anti-fungal and anti-bacterial properties. So, to obtain all these great benefits of turmeric for acne, one could simply combine turmeric with virgin coconut oil and apply it to the skin. However, this comes with one main problem. Turmeric can be messy and can stain clothes and skin yellow, so care must be exercised. . If you have tried everything for your acne and would like to give turmeric a shot, we have a solution for you. Turmeric is great for other beauty regimens. Check out our Turmeric Antioxidant Mask Unlike other Turmeric masks, ours will not stain your skin. The unique Turmeric in our mask contains significantly less yellow dye, making it a lot easier to work with. Comments Off on Turmeric as a Teeth Whitener? Really?! We are only recently becoming more aware of all the benefits of turmeric to our bodies. In addition to health benefits, turmeric also seems to have beauty benefits. Not only is it great for the skin, it also seems to whiten teeth! Yes! You read it correctly! Turmeric also helps whiten teeth! We were very skeptical, so we tried it. It sounds a little counter-intuitive to apply a rich yellow substance to yellowing teeth. However, something in that golden spice seems to be an effective natural remedy for teeth whitening. Not only will you have white teeth, there is some research shows that it may even improve oral health issues such as gingivitis and oral cancer . 1. Mix 1/2 teaspoon of turmeric with water to form a paste. Then use a toothbrush (which will be permanently stained yellow) to pick up some of the paste and brush teeth as you would with toothpaste. Alternatively, you may spread the paste over teeth with your finger and leave for 1-2 minutes. Rinse out as you would after brushing. 2. Sprinkle some turmeric into your regular toothpaste and brush as normal. 3. Mix 1/2 teaspoon of turmeric with water and use as a mouthwash. So, if you’re looking for a natural option for teeth whitening, maybe give turmeric a shot. Just remember, you won’t see a miracle after the first try; you will see gradual results with every use. Did you know that turmeric can also dramatically improve your complexion (smoothness, prevent wrinkles, acne, rosacea). Check out ReNude Skincare’s non-staining Turmeric Antioxidant Mask. Turmeric can also be enjoyed in a soothing tea. Check out this great Spiced Turmeric Tea recipe. Comments Off on Does Turmeric Really Prevent/Treat Cancer? Turmeric is a spice that is often used as a food flavoring in Asian dishes. It belongs to the ginger family. It is also known as Indian saffron, jiang huang, haridra, haldi, as the major ingredient of curry powder 2, and as a bright yellow orange food coloring agent (E100). A phase I clinical trial looked at giving curcumin to 25 patients with pre-cancerous changes in different organs. This study seemed to show that curcumin could stop the precancerous changes becoming cancer. A number of laboratory studies on cancer cells have shown that curcumin does have anticancer effects. It seems to be able to kill cancer cells and prevent more from growing. It has the best effects on breast cancer, bowel cancer, stomach cancer and skin cancer cells. A 2007 American study that combined curcumin with chemotherapy to treat bowel cancer cells in a laboratory showed that the combined treatment killed more cancer cells than the chemotherapy alone. An American phase 2 study reported in 2008. 25 patients had curcumin treatment and 21 had tumors that could be measured. In 2 patients their tumors shrank or remained stable. In some patients their levels of particular immune system chemicals that destroy cancer cells went up. But the researchers found that blood levels of curcumin were very low because it is not well absorbed from the gut. Scientists have since developed injectable, fat soluble forms of curcumin which may improve the results. These studies look promising but we need to do more clinical trials in humans before we will know if curcumin has any potential to treat cancer in people. It is important to remember that turmeric used in cooking is very safe. But we don’t know how safe curcumin is when used for medical reasons. So far, research studies seem to show that it causes few or no side effects. But we don’t know much about the side effects of taking it in large amounts to treat or prevent cancer. There have been some reports of stomach pain if too much is swallowed and skin problems if it is taken for a long time. For these reasons we recommend that if you use curcumin for reasons other than in cooking, you should talk to your doctor first. Turmeric for Beauty? Learn about it here. Interested in adding turmeric to your daily regimen? Check out this delicious recipe for spiced turmeric tea! It turns out beauty is more than skin deep: The average person slathers, lathers, rubs and sprays, 10 different skin care products on his or her body every day–and since our skin acts more like a sponge than a barrier, we absorb the nearly 130 chemicals we regularly expose ourselves to. Cosmetics companies and the FDA maintain that these chemicals are safe, and many of them are–in small doses at least. But consider that the average woman ingest as much as four pounds of lipstick in her lifetime, and you begin to understand how a little dab here a quick spray there begins to add up. The fact is, no one really knows how certain chemicals affect us over a time, or how they react in our bodies in combination. Other chemicals have known dangers: Phthalates, for example, which are often found in artificial fragrances, are a class of hormone disruptor known to cause birth defects, sperm damage, infertility, and the feminization of baby boys, for instance. Make your skin glow, naturally, with ReNude’s Turmeric Antioxidant Mask. Almost 90 percent of the 10,500 cosmetics and skin care ingredients known to the U.S. Food and Drug Administration have not been evaluated for safety by the Cosmetic Ingredient Review, the FDA, or any other publicly accountable institution, according to the Environmental Working Group. To be fair, no one’s dropping dead after a using a mascara wand or a body wash, and manufacturers have an interest in creating products that don’t harm their customers. But complex chemicals with potential unknown side effects lead us to follow the Precautionary Principle. That is to say, if we’d prefer to err on the side of safety until we know. We’re not the only ones who feel this way: More than 1,110 personal-product ingredients have been banned for use in cosmetics in the European Union because of concerns that they may cause cancer, birth defects, or reproductive ills. By contrast only 10 are banned in the U.S.
Aluminum chlorohydrate: An astringent used as a topical antiperspirant or topical body deodorant. Aluminum is a neurotoxin that alters the function of the blood-brain barrier, linking it to Alzheimer’s disease and cancer. Ammonia: A compound used in hair dyes and bleaches. It releases a caustic, pungent gas that severely irritates the eyes and respiratory tract. Dibutyl phthalate: A chemical plasticizer found in nail polish and mascara that helps prevent cracking. Studies have shown that it causes birth defects and harms male reproductive organs. DBP and other forms of phthalates are also frequently present in fragrances used in air fresheners, cleaning detergents, and hair sprays. A loophole in federal law allows phthalates to be included in fragrances without ever appearing on the product’s label, which means that phthalates are more ubiquitous than we realize. In September 2000, scientists at the Centers for Disease Control and Prevention found seven phthalates, including DBP, in the bodies of all 289 persons they tested. More alarming, however, was the fact that women of child-bearing age, who could conceivably be pregnant and expose their fetuses to dangerous toxins while in the womb, appeared to receive the highest exposures–up to 20 times more DBP than the average person, well above the federal safety standard. Formaldehyde: A preservative and disinfectant classified by the EPA as a probable human carcinogen. Found in cosmetics such as mascara and eye shadows, formaldehyde can cause nausea, coughing, and asthma symptoms, as well as burning sensations in the eyes, nose, and throat. Lead actetate: Although banned from use in cosmetics in the European Union, this lead compound, which is a known developmental and neurotoxin, can be found in hair dyes and cleansers in the United States. Hydroquinone: A skin-bleaching chemical, as well as a possible carcinogen, neurotoxin, and skin sensitizer. Hydroquinone can cause a disfiguring skin disease called ochronosis, which results in irreversible black-blue lesions. Mercury: Used as a preservative and antibacterial agent in cosmetics such as mascara, where it can be listed under the name “thimersoal,” mercury can damage brain function even at low levels. Mercury can be found in eye drops and certain imported skin-lightening creams, as well. Nanoparticles: Largely untested, these extremely minuscule particles are usually undeclared on product labels, even though they can be absorbed directly into the bloodstream. You can find them in bronzers, eye shadows, sunscreens, and lotions. Parabens (methylparaben, ethylparaben, butylparaben, isoparapben, etc. ): The most common preservatives used in cosmetics to prevent bacterial and fungal growth. Parabens can mimic the hormone estrogen, which some studies show plays a role in the development breast cancer and urogenital abnormalities. Triclosan: An antibacterial compound found in cleansers, deodorants and other cosmetic products that is classified by the EPA as a probable human carcinogen. Overuse could also result in strains of drug-resistant superbacteria. Toluene: A solvent and nervous-system toxin found in some nail polishes. High amounts can affect kidneys and cause birth defects. It’s also used to dissolve paint and as an octane booster in gasoline fuels used in internal combustion engines. If you found this article informative, here are some tips on how to take care of your skin naturally. Toxic synthetic chemicals are the biggest issue in the beauty industry today, so it pays to hone a keen eye when it comes to examining product labels. For example, it’s counterintuitive, but unfortunately, the words “natural” and “all-natural” are not regulated labeling terms. Another great resource is the Environmental Working Group’s Skin Deep Cosmetics Database site, which rates popular cosmetics and personal-care products with hazard scores on a scale of 0 to 10, depending on their toxicity. For a true natural facial treatment that really works, try ReNude Turmeric Antioxidant Mask. You can never go wrong with glass because it’s recyclable and has no danger of leaching toxins into the product contained within. As far as plastics go, polyethylene terephthalate (PET), also known by the recycling code #1, and high-density polyethylene (HDPE), #2, are most frequently accepted by municipal curbside recycling programs and are considered safe; polycarbonate (#7), may leach the endocrine disruptor bisphenol-A, or BPA. Polypropylene (#5), another food-safe plastic, is also a good alternative, though less easily recycled. Avoid containers that bear recycling code #3 and the letter “V”, which refers to polyvinyl chloride, or PVC. Dubbed “the poison plastic,” PVC poses great environmental and health hazards from manufacture to disposal. In addition to releasing hydrochloric acid, cancer-causing dioxins, and other persistent pollutants into the air, water, and land during its production, PVC also contains additives and chemical stabilizers–such as lead, cadmium, and di(2-ethylhexyl) phthalate (a suspected carcinogen that is known to cause a host of reproductive and developmental defects)–that can leach, flake, or off-gas from the plastic throughout its life. A skincare company is more than the sum of its products. What about its philosophy and values? Visiting a website is always enlightening. Does the company test on animals, for example? Has it signed the Compact for Safe Cosmetics, a pledge to remove harmful chemicals from ingredients lists and replace them with safer alternatives? How committed is it to reducing its impact on the environment? Used to make emollients for face cream or found in the form of coal tar for scalp-treatment shampoos, petroleum byproducts can be contaminated by cancer-containing impurities. A nonrenewable and environmentally unfriendly resource, petroleum barely belongs in your car, let alone on your skin. Identify it on labels as petrolatum, mineral oil, and paraffin. Every now and then, a bizarre new trend promises to be the magic bullet for all your skin care woes but ends up being downright cruel, whether to you or the planet. The use of human and cow placenta extracts is at the top of our list for being kooky and just plain crazy, especially since they contain a raft of hormones that could potentially result in breast growth in toddlers, breast cancer, and other severe health issues. Another weird practice du jour is the fish pedicure, which involves having dozens of tiny nibbling carp exfoliate your feet in 94-degree Fahrenheit chemical-packed water, a procedure we’re sure is not PETA-approved. If you enjoyed this article, you may also find our Glossary of Unsafe Cosmetic Additives useful.